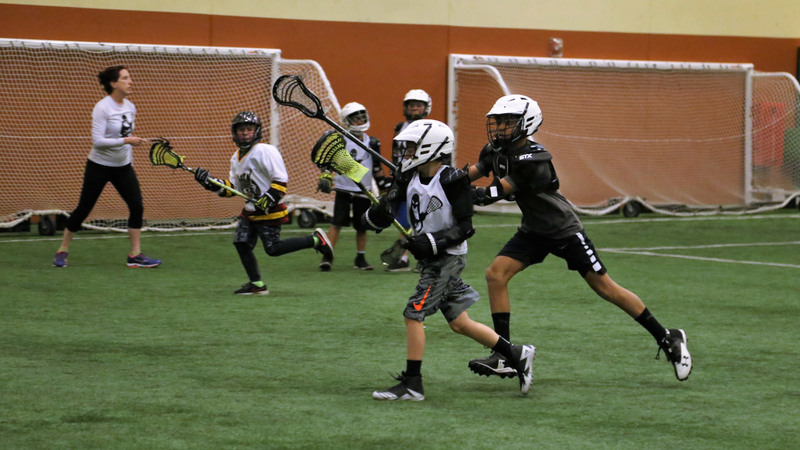 Penguins Boys Youth Lacrosse offers a Lacrosse Clinic for beginners Wednesday, February 20 through March 20 from 6:00pm-7:00pm at Falcon Park Recreation Center, 2195 N. Hicks Rd., Palatine, for ages 5-9. This introductory “soft lacrosse” clinic is for players new to the sport or players with little lacrosse experience. Players will participate in drills and scrimmages that teach the basic fundamentals and rules of the sport in a safe and fun environment. No equipment is required. Fee is $60 for Residents and $75 for Non-Residents. Penguins Boys Youth Lacrosse offers a Lacrosse Clinic for ages 8-14 on Wednesday, February 20 through March 20 from 7:00pm-8:00pm at Falcon Park Recreation Center. This clinic will focus on reinforcing basic-intermediate lacrosse fundamentals through fun drills, games, and competitions. Players must bring their own equipment. Required equipment includes helmet, shoulder pads, elbow pads, gloves, mouth guard and a stick. Fee is $75 for Residents and $94 for Non-Residents. Penguins Boys Youth Lacrosse is introducing a 3 on 3 youth lacrosse house league. Players will participate in a fun, non-competitive, non-contact developmental lacrosse program. Players will receive a reversible Penguins Lacrosse pinny as well as a beginner lacrosse stick called a fiddlestick. There will be one practice and one game per week using soft lacrosse balls. Players will be required to wear helmets and gloves. Rental equipment will be available, or participants may bring their own. League is for ages 8-14 years. Play begins in April on Wednesday and Saturday from 7:00pm-8:00pm at Ost Field, Fremont and Colfax Streets, Palatine. Fee is $75 for Residents and $94 for Non-Residents. Penguins Boys Youth Lacrosse offers a travel lacrosse team for boys in 1st through 8th grade. All levels of players are invited to learn the game of lacrosse and compete with teams from towns throughout the Illinois Boys Lacrosse Association (IBLA). Penguins Boys Youth Lacrosse provides structured training and development for beginners to experienced players. The surrounding towns of Arlington Heights, Rolling Meadows, Buffalo Grove, and others provide great depth to the program. Practices are two to three days a week depending on the team and level. A combine is run in early spring to determine the players’ skill sets and organize teams. Teams will be limited to 15-20 players, therefore, participants are encouraged to register early to avoid placement on a waiting list. Fee is $245 for Residents and $307 for Non-Residents. The registration deadline is Monday, February 25. For more information on all Penguins Boys Youth Lacrosse Programs, visit penguinslax.com. Illinois Girls Lacrosse Association (IGLA) offers a weekly, one hour clinic for participants 5-8 years on Sunday, April 15-May 20 from 11:00am-12:00pm. Clinics will be held at Cardinal Park, 155 W. Illinois Ave. in Palatine. These clinics are exclusively for girls in kindergarten through 1st grade who want to learn the fundamentals of lacrosse. The goals of this program are to introduce and develop basic skills for young players using fun games and coaching techniques. Equipment will be provided. Fee is $130 Residents and $163 Non-Residents. Illinois Girls Lacrosse Association (IGLA) Girls Spring Lacrosse Leagues are offered exclusively for girls, beginning in April. The goals of the program are to understand the rules of lacrosse, active teamwork, sportsmanship, and foster personal development in a respectful environment led by positive coaching. Two levels of league play are offered, Pink and Purple. Both are recreational, community lacrosse. If considering Purple, players must first attend an assessment where participants are assessed on stick skills and game play. Players will be notified of assessment dates, times, and locations by IGLA coaches. Age divisions from 8 – 14 years are offered. Fees for Pink Level are $200 Residents and $250 Non-Residents; Purple Level fees are $300 Residents and $375 Non-Residents. For more information and to register, visit iglax.org.